The Space Science and Satellite Technology Applications Workshop dubbed “SSSTA” is an annual international conference & workshop that was established in 2012 by the All Nations University-Space Systems Technology Laboratory (ANU-SSTL)-Ghana, as part of fulling its mandate in building human capacity and advancing the field of Space Science and Satellite Technology in Ghana and Africa. This annual conference & workshop is projected towards achieving a sustainable space program for the benefit of humanity. Since the inception of the SSSTA in 2012, it has attracted many international/local professionals and experts in this field of discipline, government personnel, students and space science enthusiasts to the University to participate and present at the conference. The conference creates the platform to deliberate and discuss innovative technology and the application of space science to enrich and solve societal problem. It however helps to educate students and the society about the benefit of space science to the society. The ultimate goal of the conference & workshop is to promote the United Nations Sustainable Development Goals for a sustainable space program in developing nations. 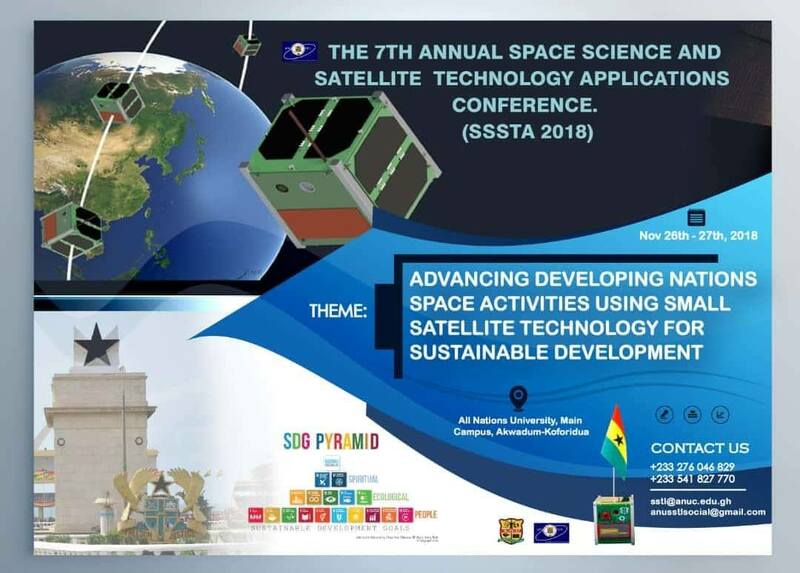 The theme for the conference is “Advancing Developing Nations Space Activities Using Small Satellite Technology for Sustainable Development” with a key focus on the development of Meteorological Satellite to enhance weather and climate related activities in Ghana and Africa. The 2-day conference is to bring together researchers, professionals and experts from around the world who are interested in exploring Space Science and Satellite Technology to share their experiences and expertise in educating the Ghanaian society and university students on the benefit of Space Technology to impacting the society and for Sustainable Development. To discuss the road-map to advancing Ghana’s space activities as well as the African nations.